Dan Kaufman is a musician and writer living in Brooklyn, New York. He has written previously about the Spanish Civil War for The Nation and the New York Times. 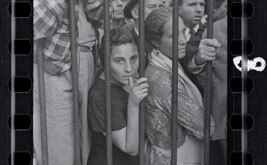 The 4,500 images in the recently discovered Mexican Suitcase deepen our understanding of photojournalism as well as the complexities of the Spanish Civil War. A long-lost memoir of the Spanish Civil War moves jaggedly between boredom, fleeting triumphs and terror.